The most likely answer is yes. Most water sources in the U.S. contain an appropriate amount of fluoride. If your child drinks tap water, she is probably getting plenty of fluoride—a cavity fighting superhero. Tooth decay happens when bacteria breaks down sugars from food, causing a harmful acid to build up on tooth enamel. Left untreated, the bacteria can force its way into the damaged tooth and cause cavities. strengthening your child’s developing teeth when she drinks it in fluoridated water. preventing the damaging acids from breaking down her tooth enamel. repairing damaged teeth and reversing low levels of tooth decay. So what should you do if you live in a non-fluoridated area? Babies under 6 months old don’t need fluoride supplements. After 6 months, talk to your pediatric dentist. Even if fluoride is not added to your water, it still naturally occurs in water. Your child’s dentist may ask you to get your water tested or he may already know if your local water supply contains the optimal .7 milligrams per liter of water. Then talk to your dentist about supplements such as fluoride drops, tablets, or vitamins. Brush your child’s teeth with a fluoride-containing toothpaste. Brush your infant’s teeth with a baby toothbrush. Apply fluoride toothpaste about the size of a grain of rice to her toothbrush. For kids ages 3 and up, use a pea-sized amount of fluoride toothpaste. Teach your child to spit, not swallow, the toothpaste. Only allow older children to use fluoride-containing mouthwash if they are at high risk for tooth decay. minutes. These trays are filled with a fluoride gel or foam. 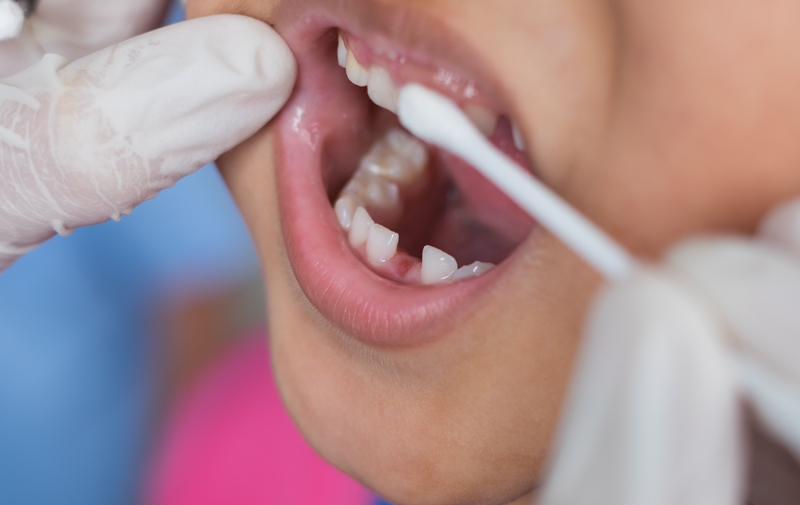 Only your pediatric dentist can evaluate your child’s teeth and fluoride needs. Make an appointment today.